I’m generally not a big believe in “October surprises,” which seem to be more numerous in folklore than fact. But this guest post by Michael Tesler made me stop and think. John Kerry believed he would have been the 44th president of the United States had it not been for the surprise surfacing of a new Osama bin Laden videotape the Friday before the 2004 election (October 29). This was one of the few points of agreement between Kerry and George W. Bush, who also acknowledged that the bin Laden video helped him win reelection. There is some empirical evidence to support those contentions too. The figure below draws on data from the National Annenberg Election Study to examine the relationship between Bush’s war on terror approval and Americans’ vote intentions immediately before and after the bin Laden tape was released. 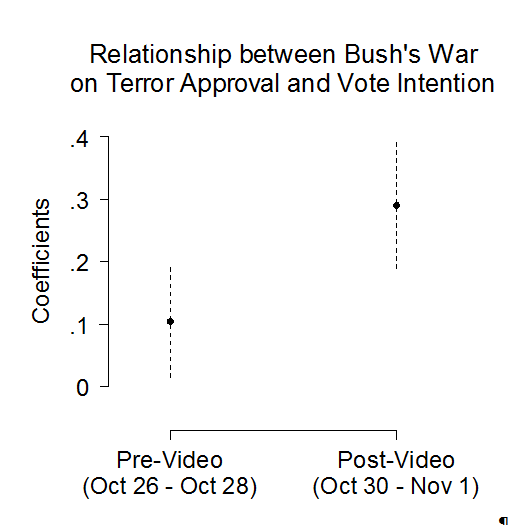 After controlling for respondents’ evaluations of Bush’s performance on Iraq and the economy—two issues where the president was underwater leading up to his reelection—the display indicates that Americans’ assessments of the president’s war on terror performance were significantly stronger predictors of vote choices in the final three days of the campaign than they had been right before the video broke. Meanwhile, the public’s more negative opinions about Bush’s Iraq and economic performance decreased in importance during that time period. To be sure, changing opinions about how Bush was handling the war on terror in the aftermath of the video’s release could be responsible for some of the enhanced relationship shown above. There are a couple of reasons to suspect that this was not the case, though. First, Bush’s war on terror approval rating was virtually unchanged among Democrats and Republicans before and after the video. 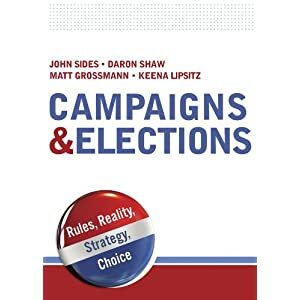 Second, Gabriel Lenz’s outstanding new book convincingly shows that performance evaluations are typically primed, rather than changed, by presidential campaigns. I always thought it was Kerry’s “flip-flopping” or perceived “flip-flopping” that did him in more than any “October Surprise”. I think by October it was pretty clear he was not going to win. While I wished Kerry would have beaten Bush, he seemed at times to be all over the place on issues. His explanations of his “flip-flips” might have been valid, but they were too complicated, I think, for most voters who probably didn’t really care at the end of the day about the nuances of his various votes as Senator. It would be interesting to see the chart above over a certain period of time. I wouldn’t be surprised if Bush had generally higher numbers through most of the campaign. Keith’s comment is temarkably off-topic, misses the point if the post entirely, and fails to support its assertions. Hat trick! What else is included in this model? Is party-id included? Is this cross-sectional data? How do the effects vary among Dems, Reps, and inds? You really think attitudes toward terrorism moved vote choice that much in the days leading up to the election? If so, then this is a remarkable finding. And a minor point, but if it’s an OLS model, those coefficients are not the impact on the probability of voting for Bush. I think the monkey cage is a great blog — one of the best and an ever increasing influence on the public discourse. But I wish this type of sensational finding came with a bit more detail and consideration before it was beamed around the interwebs. As the note states, the model only includes Bush’s approval rating on Iraq and the economy. Party id is not included because there are already three highly correlated predictors in the model, but the results are robust when including other controls. There is not enough power to discern different priming effects by party, although the increased effects are almost entirely concentrated amongst the low educated. The data are, in fact, cross-sectional, which is why there is a discussion of the possibility that the results could be driven by reverse causality. Finally these are probabilities (see: http://en.wikipedia.org/wiki/Linear_probability_model), and the results are the same when using logit. FWIW, per CNN exit polls, voters who cited the Osama bin Laden videotape as a “very important” factor in their vote broke for Kerry 53% to 47%.